Summer’s almost over….which means back to school “lunchbox drama” will soon be back in full swing. 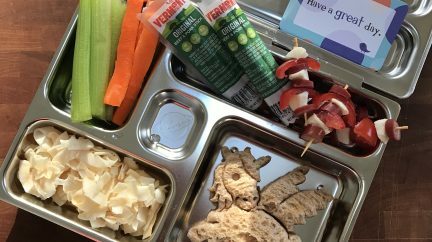 We know how hard it is to pack the lunchbox with nutrient-rich foods that your kids will actually eat, but it’s not impossible. Here are a few healthy lunchbox ideas that won’t come home in the lunchbox. Yeah, we admit it. 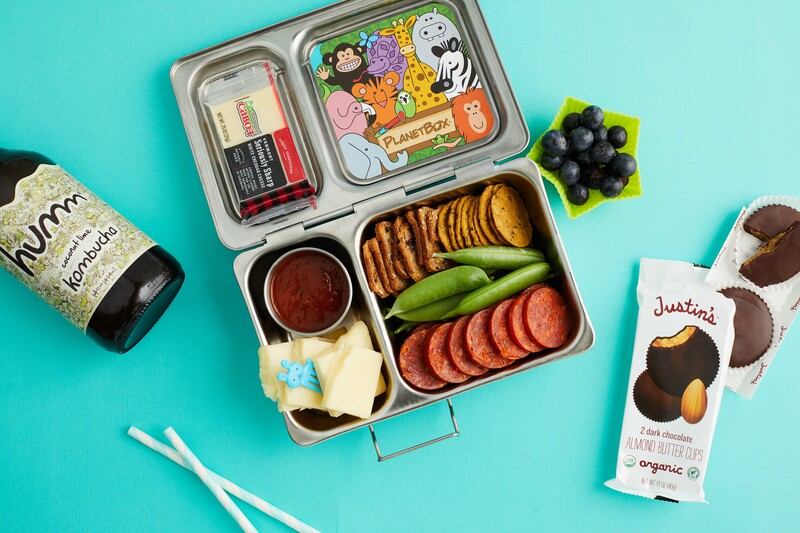 Your kids would probably devour Lunchables if you sent it with them to school, Lunchables is about as good as it gets in the lunchbox trade, but with a list of 50+ ingredients and preservatives it’s hard to have peace of mind fueling your kids for the day with Lunchables. 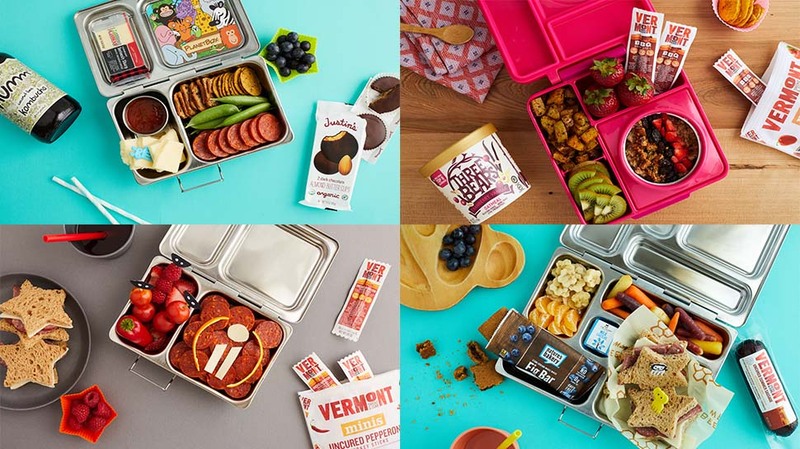 So, we upgraded Lunchables, to create a lunchbox your picky eater will love, but you can still feel good about. 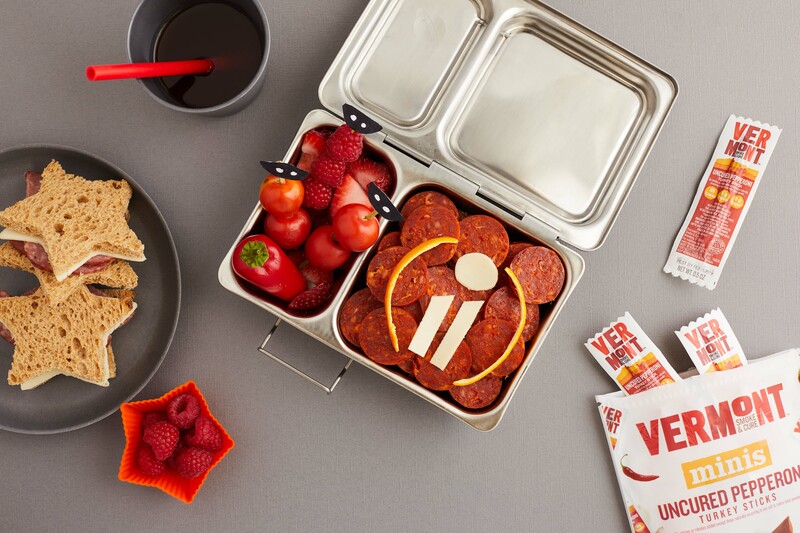 We stacked this lunchbox with all the “upgraded” staples of a classic pizza Lunchable: Smoked Pepperoni, Cabot Singles, Justin’s Peanut Butter Cups, pizza sauce, and crackers, but also added some fruits and veggies in to balance the meal out. Sometimes getting a picky eater to finish their lunch is as simple as switching up your meals. 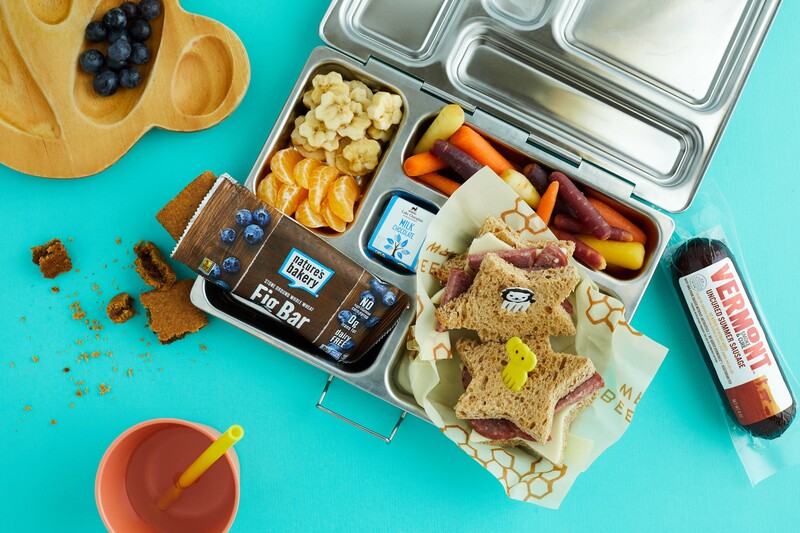 We packed this “breakfast” themed lunch to encourage our picky eaters to eat their fruits, veggies, carbs, and protein. 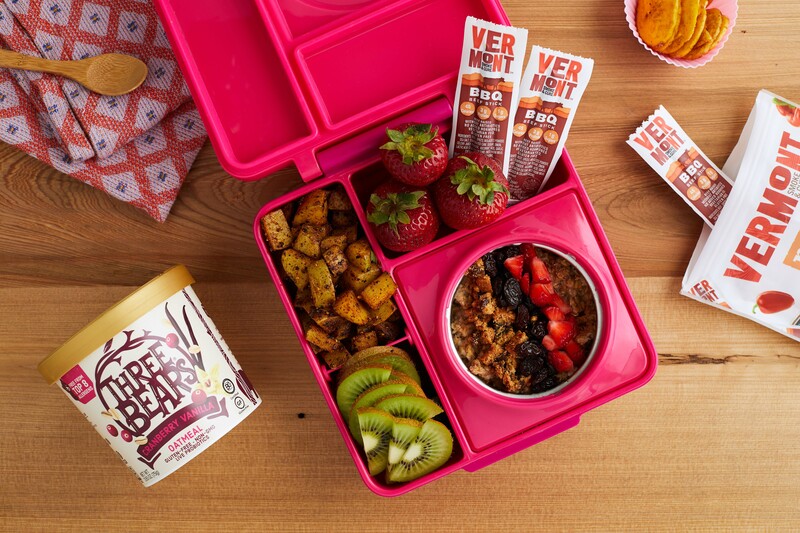 In our favorite Omielife lunchbox thermos compartments, we have Three Bears quick and easy cranberry vanilla oatmeal, garnished with freshly diced strawberries, raisins, and crumbled Nature’s Bakery fig bars. We also added Schultz’s Gourmet breakfast potato recipe, more fresh fruits and of course our BBQ minis for added protein. Okay…this one might feel a bit unrealistic for busy parents, but WAIT… HEAR US OUT. It’s simpler than it seems. On a night when you have a little more time, an Incredibles 2 themed lunchbox will be sure to get your picky eater happily munching away AND showing off his lunchbox to all his lunchroom friends. For the Incredibles “i”, we just cut three shapes out of a cheddar cheese slice, used clementine peels, and layer on a top of our Smoked Pepperoni. We just used plain paper, sharpies, and a pair of scissors to make the masks, and taped them onto toothpicks. Five minutes total. As parents of picky eaters know, sometimes packing a lunch that won’t come back home is about going back to the basics. But when even that’s not enough, we like to play with shapes to make our kid’s meals more fun. A few cookie cutters will do the job, but there are plenty of cutters made specifically for sandwiches. This lunchbox is all about better-for-you versions of the classics. Instead of a ham and cheese, we made Cabot Cheddar + Summer Sausage sandwich on whole wheat. 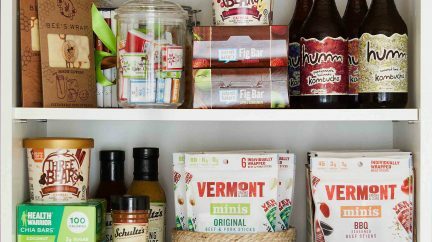 We included fruits + veggies (bananas cut into flowers), Nature’s Bakery upgraded version of the classic fig bar, and Lake Champlain milk chocolate. What are your favorite tips and tricks when packing lunch for your picky eater? We’d love to hear! And if you try out one of these lunchboxes, make sure to share and tag us @VTSmoke. ENTER THE ULTIMATE BACK TO SCHOOL GIVEAWAY!